This is the second in a series of three blog posts looking at the phenomenon of international education hubs – and the implications for UK higher education. The series is based on a session I delivered at the UK-NARIC 2016 Conference in London on 21 November 2016. In my first blog post, I looked at the broad context for the development of international education hubs, what they are and where they can be found. This post focuses on national motivations and approaches (with a couple of case studies thrown in). In some countries, international education hubs are an election issue. 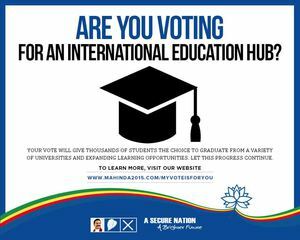 An advert from the 2015 Sri Lankan presidential election campaign (see above) asks ‘Are you voting for an international education hub?’. Hub status is often a key plank of national economic development strategy and can be strongly associated with national identity and self-confidence. In some parts of the world, enhancing educational opportunities is absolutely central to national mission in a way that we’re not really familiar with in the UK. Existing international education hubs are at very different stages of development – some are well-established (and possibly even past their peak), with others still getting off the ground. The earliest hub-building dates back to the mid-1990s. Singapore started investing in its ‘global schoolhouse’ initiative in 1998 but began reining back when it capped international student enrolments in 2011, well short of its original goal to attract 150,000 by 2015. The national priority had changed to building capacity for Singaporean students – but only after extensive government funds had been ploughed into the ‘global schoolhouse’. Qatar began investing in its Education City even earlier. Its case is unusual since the costs (including the operating expenses) of all physical infrastructure and facilities are met by the non-profit government-linked Qatar Foundation. Around a decade later, in 2007, Bahrain first hinted at its hub plans, with Botswana making a similar announcement in 2008. Botswana is counting on significant foreign investment, through government funds are also being invested. More recently (over the last year), Malta has started to position itself as an international education hub, seeking to attract more foreign providers. While these different countries have a range of models – and sources – of funding, Jane Knight notes that some degree of domestic public investment is critical to the development of education hubs. Malaysia’s hub activity is financed by a mixture of public domestic, private domestic and private foreign investment (mainly the first two). Like the UAE, its initial public investment has been successful in attracting private funding streams. In other countries (Singapore and Qatar), there has been almost total reliance on state finances over an extended period, which raises some questions about sustainability. Move towards knowledge or service-based economy. Jane Knight (link to pdf) has categorised hubs into three main types, based on their purpose. The Student Hub focuses on Education (building a critical mass of foreign students and providers to generate income, modernise and internationalise domestic HE). The Talent Hub focuses on Workforce Development (training and talent-building for foreign and local students and employees). The Knowledge / Innovation Hub focuses on knowledge production and innovation (attracting foreign students, institutions and companies to build a vibrant research, knowledge and innovation sector to lead them into the knowledge economy). Each hub type is generally more complex than the previous one. Some hubs focus on the needs of their local region, others have (or aspire to have) much more global reach. Dubai, in the UAE, is now the third most popular education destination for students from the Middle East (after the US and France). Dubai Knowledge Park (formerly known as Dubai Knowledge Village) was established in 2003 as a free zone to ‘develop the region’s talent pool and establish the UAE as a knowledge-based economy’. The motivation behind all this is to free the UAE from its dependence on oil revenues. In 2007, it decided to concentrate all its higher education operations, institutions and facilities in Dubai International Academic City, described as ‘the world’s largest free zone dedicated to higher education and the pursuit of intellectual growth’. It is complemented by two other specialist zones: Dubai Health Care City and Dubai International Financial City (which hosts five leading business schools including Cass and London Business School). Dubai International Academic City is home to 23 academic partners from 10 countries (with India, the UK and Australia dominating). UK partners include Heriot Watt and Middlesex universities, which have campuses there. Between them, the academic partners offer over 400 programmes to more than 24,000 students from 145 different countries. Students are mainly expatriate (50%) and international (40%), with 10% local. Qualifications range from certificate up to doctoral level. The costs (including rent) are borne by the institution, but profits can be fully repatriated – without liability for taxes or customs duty. The Botswana Education Hub project is part of a wider Botswana Excellence Strategy. Its Vision is that ‘Botswana will be recognized internationally as a preferred destination for international students, scholars and trainees. The education sector will be vibrant, contributing to economic diversification and sustainable growth’. Its main focus is on the regional needs of southern Africa and the development of domestic institutions (so that fewer students from Botswana need to study overseas, which has traditionally been supported by government funds). There is currently only one international branch campus in Botswana (that of Malaysia-based Limkokwing University of Creative Technology, which has a dozen other campuses worldwide, including one in London). Although the hub plans were negatively affected by the 2008 global economic crisis, they are still broadly on track. The main investment to date has been in scholarships for international students and the establishment of a new university – Botswana International University of Science and Technology. The hub covers all levels of education from pre-primary up to tertiary. It includes a number of key programme strands such as the Top Achievers Scholarship for incoming international students, an ‘Adopt a School’ initiative, and a drive for investments and partnerships in Education and Training. It has developed a Study in Botswana sub-brand to work on attracting international students. From a low base of just over 250 students in 2009, numbers had increased fivefold by 2013. Good governance and economic management. Although the Botswana and Dubai hubs have quite different operating contexts, what they do have in common is the drive for economic diversification. For further information on individual education hubs, see these excellent WENR articles on hubs in Asia and the Middle East and Africa. My final blog post on this subject will focus on the opportunities that international education hubs open up for UK higher education institutions.